Functional Electrical Stimulation (commonly referred to as "FES") is a therapeutic treatment, which uses transcutaneous electrical current to initiate contractions of the paralyzed lower extremities of individuals who have sustained spinal cord injury. The order and strength of the contractions are sequenced by a computer microprocessor to generate controlled and purposeful motion of these segments. 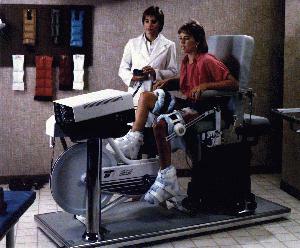 Using this system, an individual can actually pedal a leg ergometer, or specially adapted exercise bike. Some of the more recent applications include therapies that allow an individual to accomplish limited upright walking! It has been reported by a number of qualified researchers that the treatment reverses muscle atrophy, cardiopulmonary deconditioning and loss of heart mass, improves circulation and minimizes reduction of range of motion in spinal cord injured patients. It has also been demonstrated that there is improved management of spasticity and a decrease in infection- related illness. The NSCIA CT Chapter sponsors a growing number of independant facilities in both clinical and community settings that allow individuals to use Functional Electrical Stimulation (FES)bikes. To be eligible, the individual must have been trained in the proper use of FES in a clinical environment, and must be able to utilize the apparatus independently (either by themselves or with their own assistant). The following rehabilitation centers in CT currently have FES equipment on premises. The programs offered to in-patients and out-patients vary from location to location, but they represent a clinical environment where a potential SCI candidate can be evaluated and initially trained in the use of the FES equipment. Please contact them for specific details on the types of programs they offer. The NSCIA Connecticut Chapter now offers 4 locations for FES of it's own, where those previously evaluated and trained in a clinical environment may utilize FES bikes independently. The equipment has been donated from both individuals and rehabilitation centers, and the CT Chapter maintains the bikes through fundraising, grants and donations. Any users of equipment in any of the above 3 locations must be willing to assume complete risk of injury and liability; much as you would in a normal gym or healthclub. 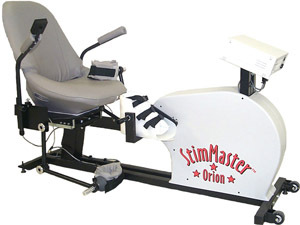 The CT Chapter stresses that these programs are intended for use by experienced FES riders who can provide their own assistance if needed, and who have been instructed in a clinical environment by qualified rehabilitation professionals in the safe and effective use of Functional Electrical Stimulation equipment.